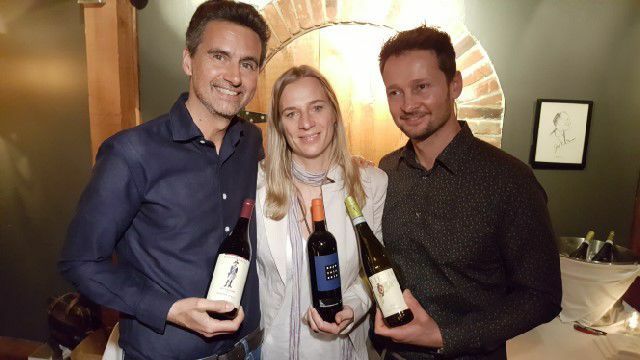 From left, are Italian winemakers, Pietro Ratti, Barbara Widmer and Dario Pieropan. Italy is made up of 20 regions, each of which produce wine. Three of the most well-known regions are Piemonte, Tuscany and Veneto and within these regions are the famous areas of Soave, Barolo and Tuscany. When I was invited to lunch to meet three winemakers from these regions, I could not think of a better trio of wines to take us through a meal — from the crisp whites of Soave, to the earthy elegant wines of Barolo to the bold fruity wines of Tuscany. And while these three regions are independent, as are the winemakers who were in town, what they share is a connection to history, a passion for flavor and a story to tell. Dario Pieropan is the fourth-generation winemaker at his family’s iconic namesake winery Pieropan. First started in the late 1800s, the winery is in the historic town of Soave in the area of Verona. Pieropan was one of the first wineries in the Veneto region when Leonildo Pieropan purchased the winery. A century later, the winery is run by Leonildo’s grandson, Leonildo “Nino” Pieropan and his sons Dario and Andrea, an agronomist. Credited with increasing the quality of wine grapegrowing in Soave, Pieropan was the first winery to produce single-vineyard Soave Classico in 1971. Today, Pieropan is the reference point for high-quality Soave. Pieropan has 140 acres of sustainably-farmed vines planted on hillsides, including two single vineyards. The grapes that make up Soave, garganaga and trebbiano, are grown in a variety of soils, including volcanic, stone, calcareous and clay. The black volcanic soil adds to the acidity and minerality of the wines, while the white soils add a richer, rounder, softer fruitiness to the wines. The Pieropan Soave wines are crisp and minerally but have great potential to age. And most importantly, they are meant to be paired with food. Pieropan Soave Classico 2015 ($20) — A blend of 85 percent garganega and 15 percent trebbiano di Soave from volcanic soils, this wine is a straw color with aromas of white peach and honeysuckle. On the palate, there are notes of lemon and apricot and has crisp acidity, making it a wine to pair with fish and vegetables. Pieropan Soave Classico La Rocca 2014 ($30) – Made with 100 percent garganega, La Rocca is a single vineyard from a hillside vineyard with chalky and clay soils. The wine is a bright yellow color with notes of tropical fruit on the nose. On the palate, the acidity is soft and the finish is long and elegant. This wine can be paired with a rich dish of lobster or scallops. Renato Ratti purchased his first vineyard in the commune of La Morra in Piemonte in 1965 and changed the course of Barolo wines. Through his understanding and appreciation for many wine regions around Italy and Europe, he noted the differences between each sub-zone of Barolo and drew the first map of the zone’s vineyards. With each vineyard’s distinctive characteristics, Ratti was one of the first to produce single vineyard Barolos. Today, his son Pietro Ratti continues his father’s legacy. Managing 86 acres across six vineyards in La Morra, Mago and Costigliole d’Asti, Ratti focuses on the uniqueness of each vineyard. From one vineyard to another, only five miles apart, the microculture affects the grapes. The resulting wines are graceful, elegant and complex. Renato Ratti Langhe Nebbiolo 2014 ($25) – The nebbiolo comes from the Ochetti vineyards in the sandy hills above the Tanaro River. After one year in the barrel, the wine has red fruit aromas of strawberry and raspberry, as well as earthy notes. It is elegant and accessible with bright acidity and soft tannins. Because it comes from the hills outside of Barolo, it is a very affordable and ready-to-drink nebbiolo. Renato Ratti Marcenasco Barolo 2012 ($50)—Located in La Morra, Marcenasco is the site where Renato Ratti created La Morra’s first single vineyard wine in 1965. The nebbiolo was fermented in stainless steel and aged for two years in large Slavonian casks. The wine is both bold and elegant with aromas of cherry, plum, licorice and tobacco. It is a beautiful wine that will age for more many years. The Widmer family purchased property in Tuscany and established Brancaia in 1981. Originally from Zurich, Switzerland, Brigitte and Bruno Widmer fell in love with a Tuscan estate while on holiday. Located in the hillsides of Tuscany, the house included 17 acres of grapevines. Today they have two estates, one in Chianti Classico and one in Maremma. Barbara Widmer was raised in Zurich and studied architecture. But after spending time at her family winery, she found her true love. After completing studies in wine, she took over as winemaker in 1998. As a result of her dedication to terroir and artisan winemaking, Brancaia wines are elegant and complex. Brancaia Il Blu 2010, IGT Rosso Toscana ($85) – A blend of 50 percent sangiovese, 45 percent merlot and five percent cabernet sauvignon, this Super Tuscan comes from 32 acres in the Castellina area of Chianti. The juice, which spends up to 25 days with the skins, was aged for 20 months in new and used French barrels. The full-bodied wine has lovely aromas of blackberry and blueberry with chocolate on the palate and silky tannins. Brancaia Ilatraia 2012 ($70) – Named for the estate vineyards in Maremma, the Ilatraia is a blend of 40 percent cabernet sauvignon blanc, 40 percent petit verdot and 20 percent cabernet franc. With its proximity to the Mediterranean coastline and the sandy clay soils, the resulting wine is full-bodied with intense aromas of blueberry and licorice and has a long finish.